If you've never been to Houston, Texas, it's probably hard for you to imagine just how big and spread-out this city really is. According to Wikipedia, Houston proper is 1295 square miles, and Houston Metro Area (which includes several suburbs) measures 10,000 square miles! My suburb lies about 25 miles Southeast of Downtown Houston, so understandably I rarely visit the areas to the north. 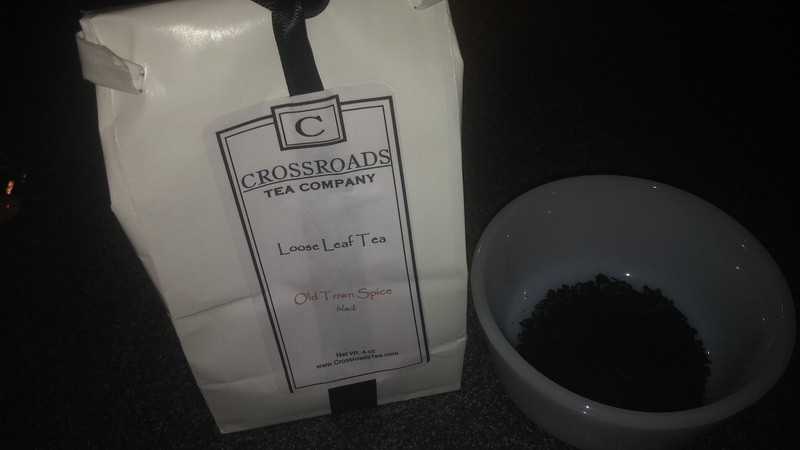 In the summer of 2014, one of the Meetup groups I belong to was having a lunch at Crossroads Tea Room in Old Town Spring. In my ten years of living in the Houston area, Old Town Spring was one place I had been meaning to visit but hadn't had the opportunity yet. Friends? Lunch? A tea room? It was the perfect excuse! Lunch with the other ladies was delightful! One of the teas we enjoyed was the Old Town Spice, a black tea flavored with sweet cinnamon oil! 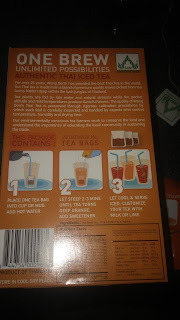 I loved this tea so much that I bought a bag of it for myself and a bag of their decaf for my mother-in-law! 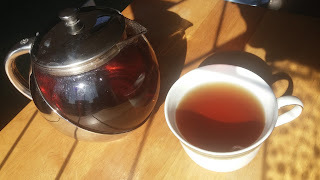 This past Sunday, I made a pot of the Old Town Spice tea to share with my husband. He also enjoys this one a lot, because it reminds him of those cinnamon red hot candies. 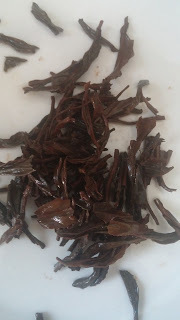 The dry tea leaf pieces are very small and tightly rolled, like a Middle Eastern or Indian-style black tea. The dry aroma is overwhelmingly red-hot cinnamon. I used 1 tablespoon of tea to 3 cups of boiling water and steeped the tea for 4 1/2 minutes. The result was a stunning rich cinnamon-red-brown liquor with the ever-present cinnamon scent. This is definitely one of my favorite teas ever. If the description of this tea sounds uncannily like the Cinnamon Spice Tea from Harney and Sons, you're not the only one who sees the resemblance! I'm not sure who came up with this concept first, Harney's or Crossroads Tea. But either way, I'm glad this style of tea exists under multiple brand names! There! I said it! They say the first step is admitting you have a problem. 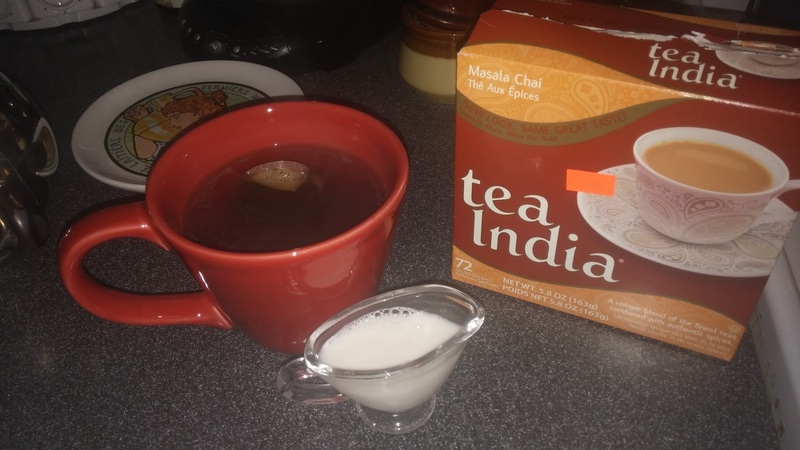 I confess I have an addiction to masala chai tea bags from Indian groceries! 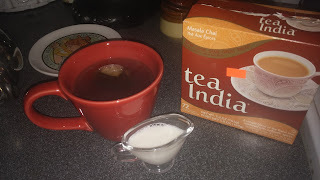 My favorite at the moment is Masala Chai from Tea India. At just $4.99 for a box of 72 tea bags, it's a pretty good deal! These are round tea bags (like the ones from Republic of Tea). Ingredients are: black tea, ginger root, cardamom, cinnamon, black pepper, cloves, and "natural flavors". In other words, typical masala chai ingredients. The aroma of the teabags before steeping is predominantly cloves, cinnamon and ginger. Directions call for 1 cup of boiling water per tea bag, steep for 3 to 5 minutes. 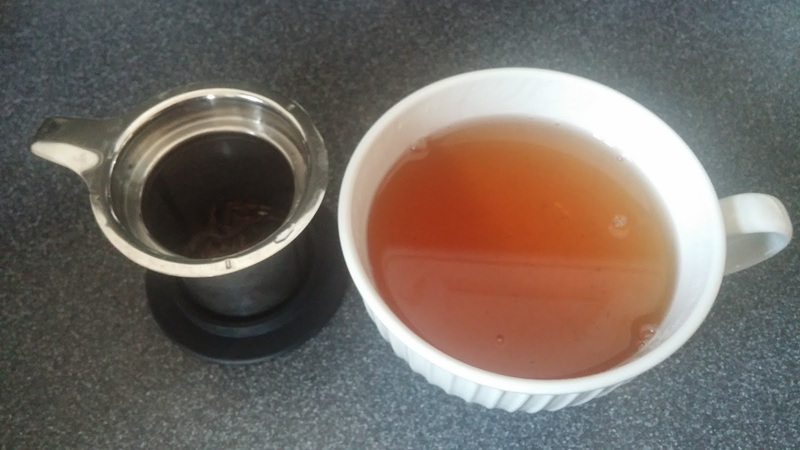 I tend to steep my black tea on the longer side if I'm just doing a single steeping, because I like that "bite" that stands up to milk and sugar. 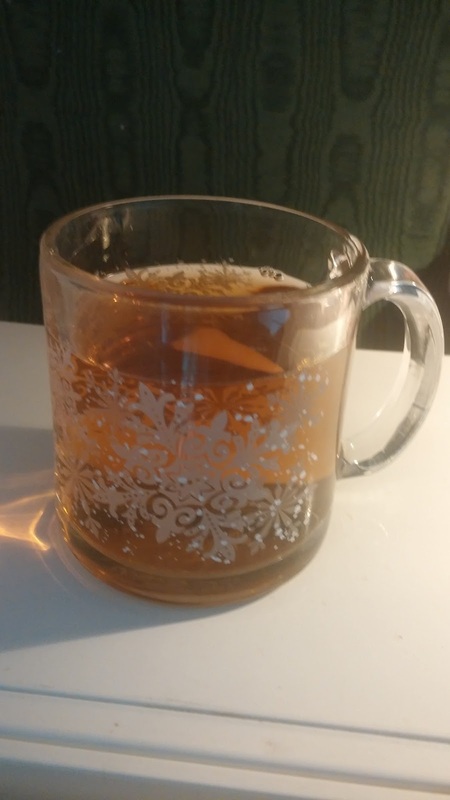 The steeped tea smells like a lemony black tea with cloves, I don't really smell the other ingredients, but I do taste them! This is a nice brisk tannic, jammy tea with a heavy clove flavor. 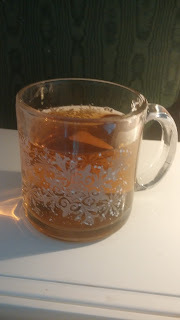 What I love about masala chai from India as opposed to the more American-style blends (like Starbucks) are the cloves and black pepper: those spices both give it a kick and really add substance and essence. This tea yields a beautiful cinnamon-brown-colored liquor. This morning I added some coconut sugar and some coconut-almond milk. I've had it before with regular white sugar and cow's milk and it's delicious like that too. Now that you know my secret, do you still respect me? Today I review honey black tea from TECA Tea in Houston, Texas. Formerly Ten Ren Tea, this shop in Southwest Houston/Bellaire's Chinatown is now called Ten Yen Tea. 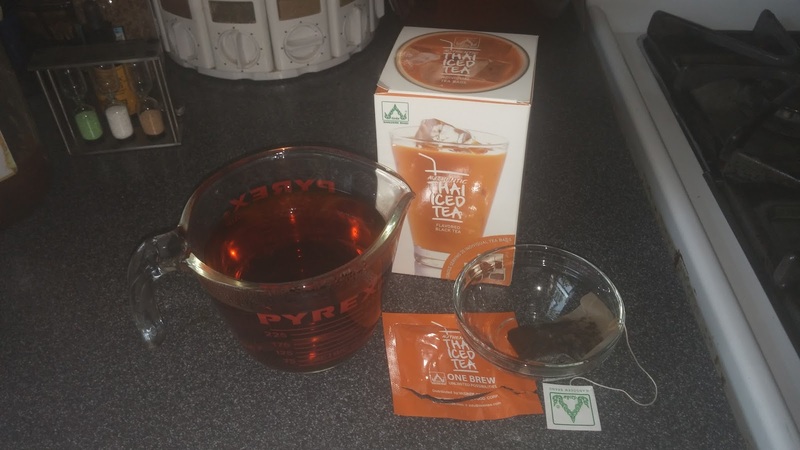 TECA Tea is their own line of tea. The owners, Richard and Pauline, are Taiwanese Tea Masters who speak multiple languages. It's a beautiful shop with a choice selection of quality teas and teaware. If you've been looking for supplies for gong fu cha (Chinese tea ceremony), you'll go crazy in here! There's usually something tasty to sample while you shop. Anyway, back to the tea! This is one of three teas I bought the last time I was there with my Meetup Group (Tea and Conversation with Friends Meetup (Houston Metro Area). There is not a lot of information on the label, but from what I can tell, it's not actually honey-flavored. It appears to be a mild Chinese black tea with a naturally sweet aroma. Per the instructions on the label, I did the first steeping (1 teaspoon in 8 ounces of water) at 200 degrees for 3 minutes. It yielded an amber liquor with a smooth, floral flavor. I tasted notes of jasmine, roses, and honeysuckle. There is no bitterness to this tea at all, but it's highly astringent. After a few sips, I got that telltale dry mouthfeel. This tea does NOT need milk and sugar! I believe it would overpower the delicacy of this black tea. 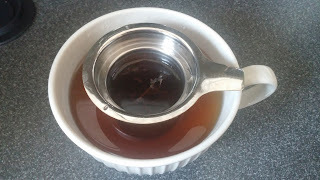 However, I did add a little honey to the second steeping. Since I don't get to Phoenicia Foods (the international food supermarket in Houston) very often, I texted a few friends to see if they needed anything while I was there. One of them (a friend from Iran whom I hadn't seen in months) called back right away and said, "You're not going to believe this. My mother is visiting me from Iran and we ran out of pita bread and French feta cheese. I told her I didn't want to drive all the way to Phoenicia to get more. And then I got your text message! Nobody has EVER texted me from Phoenicia to ask if I needed anything!" Apart from learning that there is such a thing as French feta cheese (I'm French and I didn't know! ), my good deed was rewarded when my friend came to my house that evening to pick up her bread and cheese. Not only was I reimbursed in cash, but she gave me a bag full of teas from Teavana that she no longer wanted! 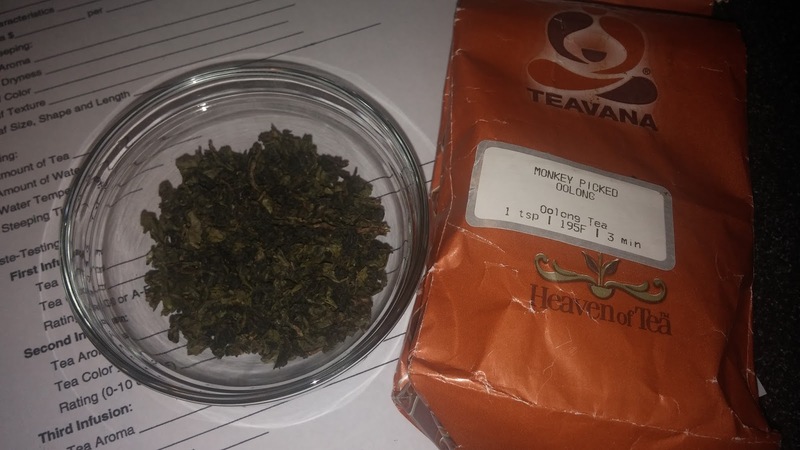 The next day, I decided to try the Teavana Monkey-Picked Oolong. The image of monkeys picking leaves in tea fields and climbing ancient tea trees to reach the highest tender buds is highly amusing, although I know it's not accurate. This tea is slightly past its prime, but nonetheless it's a welcome addition to my collection. My husband loves oolong tea, and not just because we read somewhere that it's good for hangovers! 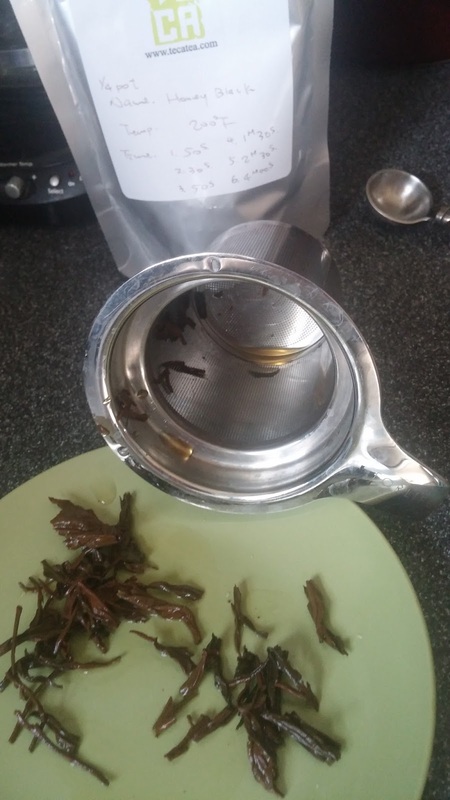 The other oolong teas in my cabinet are darker and more oxidized, whereas this one is a less oxidized tea that's closer to a green. The dark green leaves are flecked with lighter specs of yellow-green and rolled into uneven, slightly misshapen balls. The dry leaves have a mild, pleasant vegetal aroma. I used a heaping teaspoon of leaves per cup and steeped the tea for three minutes at 195 degrees Fahrenheit. This yielded a yellow-gold cup of mild tea with that distinctive flavor that is present in Japanese teas such as sencha, and which always reminds me of eggs or broth. There were also notes of chrysanthemum and a delayed astringent mouthfeel. I did a second steeping for five minutes at 190 degrees Fahrenheit and got an amber-hued liquor that was very mild (perhaps because the tea was older) with no bitterness or astringency. I tasted muted notes of egg, vegetable broth, seaweed, chrysanthemum and jasmine. 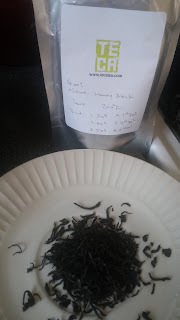 Conclusion: not a bad tea. 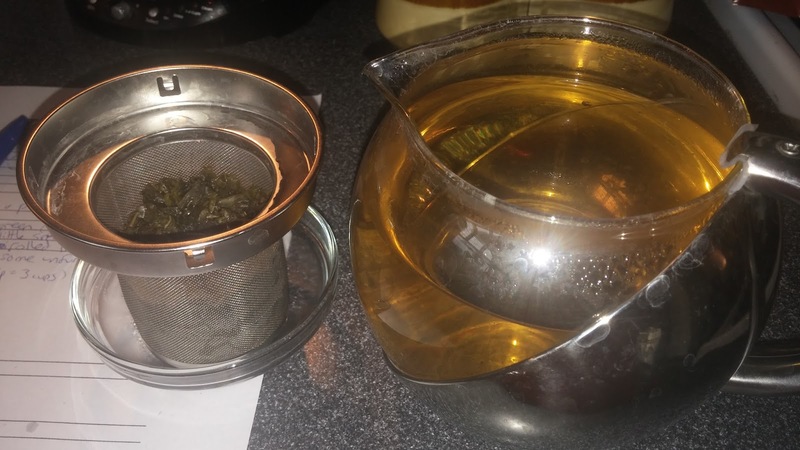 Not as bold as some oolongs, but it'll do when the oolong craving hits. I'd be curious to taste this fresh. Last week I drove an hour to go to a networking event, which gave me an excuse to go shopping at Phoenicia, an international supermarket in West Houston (Energy Corridor/Westchase area). Despite having more than a cabinet's worth of tea at home already, I couldn't help but browse the tea aisle. 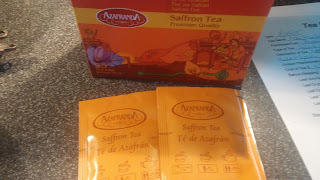 I was excited to find (among other things) a saffron black tea from Spain! The brand name is Azafranda: it's manufactured in Spain and distributed by Sadaf Foods in Los Angeles. The ingredients are black tea (97.5%) and saffron (2.5%), and the price ($10 for 25 teabags) seemed in keeping with the price of saffron. I know that many "tea snobs" are anti-teabag, but sometimes you just want convenience along with your flavorful tea experience. 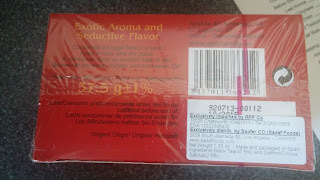 The origin of the tea itself is not listed on the package, but the phrase "exotic aroma and seductive flavor" is! 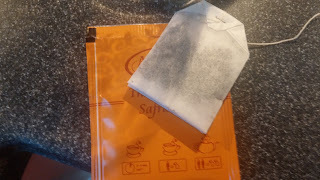 The aroma of saffron was indeed redolent in the dry tea bags. I used a cup of boiling water per tea bag. 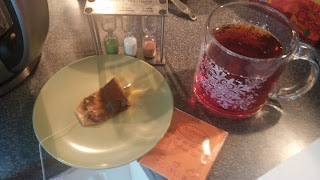 The first one I oversteeped at five minutes: it proved to be a strong, very astringent cup of black tea with a lingering after-note of saffron. 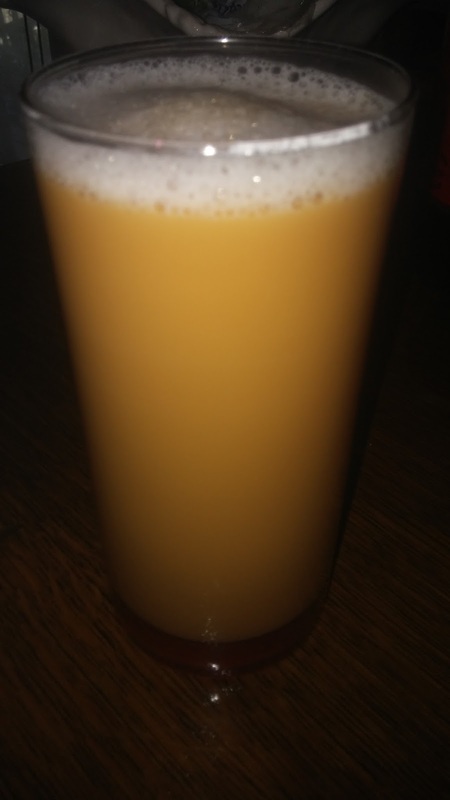 It was too bitter to drink straight, but it stood up well to two sugar cubes. The second tea bag I only steeped for three minutes, but even with the shorter steeping time, it made for a brisk cup! This time I added a splash of milk along with sugar, and WOW! The saffron flavor really popped! It reminded me of some Indian desserts I have had. All in all, I'm quite pleased with this tea. 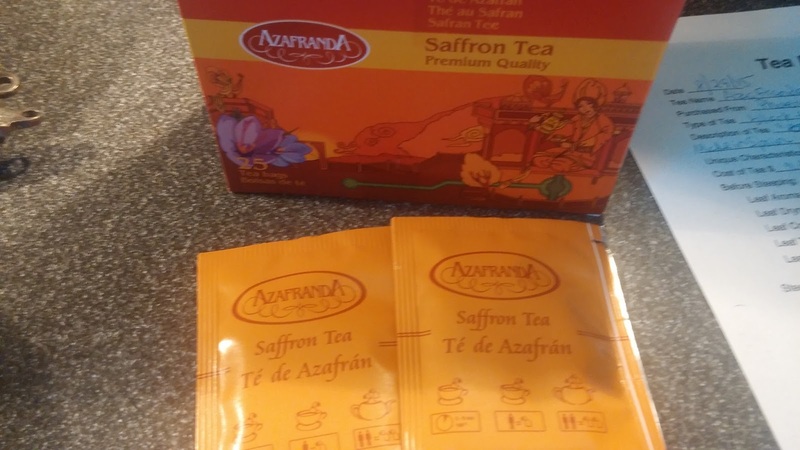 In the mornings I often crave a strong cup of black tea that I can enjoy with cream and sugar, and the added saffron flavor gives this tea a sense of exotic luxury.